However, finding the proper gear for snorkeling can be a daunting task, especially for beginners who are not familiar with the various aspects of these gadgets. That is why we created this comprehensive guide that will walk you through all the characteristics and features of snorkel sets and will help you pick the best snorkel gear for your needs and level of experience. There are several moving parts involved in the process of choosing the set that fits your needs. Some options lack features that are essential to a good snorkeling experience while others are more geared toward professionals and advanced users. Before picking a particular model, you need to make an honest assessment of your skills and experience and only opt for the option that is tailored for you. Below is a brief look at some of the important factors that you have to be aware of in order to make an informed purchasing decision. There are two main options when it comes to snorkel masks; full face snorkel masks, and traditional snorkel masks. Each type offers a number of advantages and drawbacks. Full face masks provide a wider view and better protection against leakage and fogging whereas traditional masks are more open and exposed to the elements. All factors considered, full face snorkel masks are the superior option, but advanced snorkelers might prefer the challenge of using a more physically demanding piece of equipment. The quality of the mask is a critical factor that determines the quality of the set. It should be made from high-quality materials and needs to have ample padding in order to provide an adequate level of comfort. A good mask should preferably have adjustable buckles and an impact-resistant glass lens. Snorkels come in four different types; Classic, flexible with purge, semi-dry, and dry. A snorkel that meets the baseline requirements should have a comfortable and sealed mouthpiece that prevents water from entering the breathing tube, a purge valve that expels any leaked water, and a dry valve among other features. Size should also be taken into consideration before buying a set. The size of a person is directly correlated with their lung capacity and their ability to exhale. For a small person; the bigger the mouthpiece and the tube are the more tedious the process of exhaling becomes. That is why it is advisable to get a set that has a reasonably-sized mouthpiece and a tube with an average diameter. Also known as flippers, these tools allow you to push against the water and are attached to your feet. The market is filled with a multitude of models and picking the right one might seem difficult due to the sheer number of options that are available to you. However, identifying the right fins for you is a fairly straightforward process. Fins with open heel design and adjustable straps are generally more comfortable, whereas short fins are more compact and take up less space in your bag. Picking one of the two options is ultimately predicated on determining where your priorities lie. While it is possible to swim without them, fins play a significant role in boosting your speed and increasing your efficiency by reducing the effort that you have to make underwater. More importantly, they protect your feet from the potential injuries that could be sustained when you come into contact with rocks and sharp objects. Over the past couple of years, a number of new companies have entered the snorkel equipment market. While some of them have managed to offer good products and bring new innovations to the industry, the vast majority have been rather underwhelming. 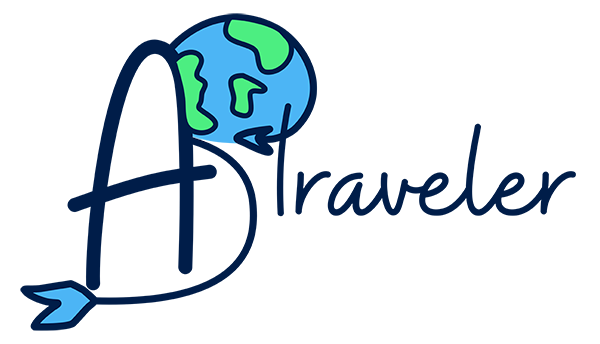 It is advisable to stick to the established brands that have a proven track record in the field and a long history of delivering what the customers need. This all-encompassing package is a great option for anyone looking for a set that can be used by the entire family. The gear comes in different shapes and sizes and includes a full face snorkel mask, extra diving fins, anti-fog spray, and an integrated action cam mount among many other parts and features. The mask that is included in this package is probably the set’s biggest selling point. It is very comfortable and is equipped with an extra cushioning around the nose and upper cheekbone sections. These two areas are often subject to a lot of pressure during prolonged wearing, which can result in severe discomfort if the mask isn’t padded properly. Besides the comfort that it provides, this mask is made from high quality materials and is designed to withstand the various elements that it comes in contact with. Some of the features that make this set both practical and safe include a built-in valve that helps you avoid swallowing water and the GoPro mount that allows you to place a recording device on top of the mask and record your experience in an effortless and fun manner. 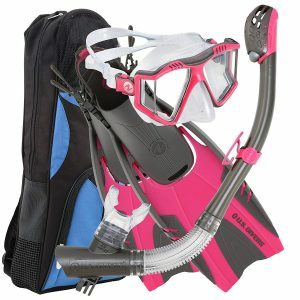 This is one of the top selling snorkel sets in the market. It is equipped with Cozia’s latest snorkeling technology and boasts a plethora of professional-grade features that ensure safety, comfort, and an overall fun snorkeling experience. It is suited for both adults and kids and comes in three different color options. 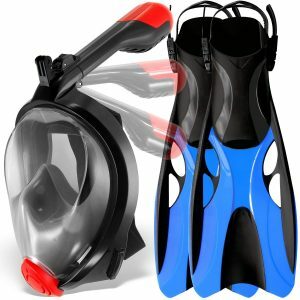 This set includes a highly practical full face snorkel mask with adjustable straps and newly designed diving fins. The mask is remarkably durable and features a polypropylene frame and shatter-proof polycarbonate window. Unlike a significant number of snorkeling gears in this price range, the view that is provided by this mask is fairly wide and completely unobstructed. The package is rather comprehensive and contains everything that you would need for the perfect snorkeling adventure. On top of the high-quality gear, you also get a dry top seal that keeps water from permeating the mask, a one-way drain valve that ventilates leaked water, and a set of breathing chambers that create airflow in order to eliminate fogging. This can surely become your best snorker gear. This set is mostly destined for advanced users and comes with all the necessary components that you’d expect for this price point. The set has been a favorite among avid snorkelers for quite some time now. Novice users can also use it as long as they are willing to deal with the learning curve that comes with it. As it is the case with any premium snorkeling set, the US DIVERS Lux is GoPro ready and offers a wide 180 angle view thanks to its four-window mask and the visibility that is provided by the lens is simply outstanding. The built-in purge valve is highly effective when it comes to getting rid of extra water and the dry top snorkel helps keep water out of the breathing tube. Another essential feature that makes this set such as a comfortable option is the quality of the mouthpiece. It is made from silicone and is entirely ergonomic. 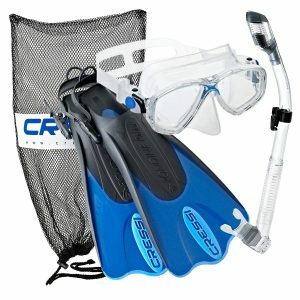 This set of snorkeling gear is made by Cressi, one of the most established and respected brands in the space. 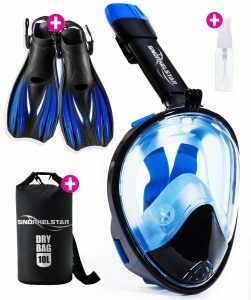 The package includes Palau short fins, a two-window mask made of silicone, 100% dry snorkel; and a carry mesh bag. The two-window mask provides a decent viewing angle and the lens is made from good quality materials. The dry top snorkel that comes with the set is equipped with a built-in special valve that prevents water from entering the tube when you are diving. The Palau SAF is perfectly suited for avid snorkelers, both beginners and advanced. The ergonomic shape of the mask offers maximum comfort and ensures its compatibility with a wide range of faces while the open heel design of the short blade snorkel fins enables them to accommodate all sizes. 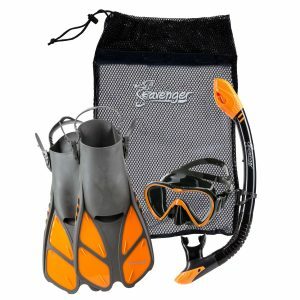 The Seavenger diving set offers the best value for the money in the market. While it is primarily designed as an introductory kit for beginners, it boasts a number of features and intrinsic qualities that make it an ideal option for avid snorkelers regardless of their level of experience. Like all Seavenger products, all the components of the set are sturdy and are built to last for years. The lens is made from premium shatterproof tempered glass and provides a panoramic view that is wide and crystal clear. The overall malleable and flexible design of the mask and the mouthpiece offers a level of comfort that is unmatched in the entry-level price category. Another major advantage of the Seavenger diving set is the remarkable lightness and compactness of the gear, which makes it easy to pack and carry around. This is especially valuable for avid travelers who often carry a significant amount of luggage. The best snorkel gear needs to provide the utmost level of comfort and fun to the user, and all the sets that we reviewed in this guide offer that. However, it is essential to keep mind that not all models are suited for everyone. Some might be a little bit pricey for someone on a tight budget, while others are more geared toward advanced snorkelers. To get the most out of your snorkel gear, make sure to get the option that fits your profile.